Piracy is an international problem disrupting global trade and endangering human lives and property. It poses serious threat to the safety of navigation and as well as to the marine environment. In common parlance, piracy is generally understood as violence or depredation on the seas for private ends without authorization by public authority. However, there exist no authoritative definition of the term as there is no unified view as to which acts should be considered piracy. This has led to persistent confusion in arriving at any common understanding of the 'piracy problem'. Several United Nations Instruments address the problem of piracy, including the convention on the High Seas, the Convention for the Suppression of Unlawful Acts Against the Safety of Maritime Navigation (SUA Convention), the Convention on the Law of the Sea (UNCLOS). However, from a practical point of view, understanding of piracy is somewhat confusing as the current system reports all crimes against ships as piracy. In addition, the definitions of the term under different legal instruments appear in some cases to be inadequate having also limitations of its own and in some cases tend to overlap with certain other types of distinct nature of maritime crimes, for example, armed robbery, maritime terrorism, unlawful acts against ships etc. (b) any act of voluntary participation in the operation of a ship or of an aircraft with knowledge of facts making it a pirate ship or aircraft;(c) any act inciting or of intentionally facilitating an act described in sub-paragraph (a) or (b)." (b) any act of inciting or of intentionally facilitating an act described above". This definition is broader than the international legal definition. The definition is not concerned with a formal legal definition but can be mentioned as a quite practical one in a way to effectively register pirate attacks. This functional and widely used definition thus covers actual or attempted attacks whether the ship is berthed, at anchor or at sea but excludes petty thefts unless the thieves are armed. Article 101 of UNCLOS also restricts piracy to actions for private ends, such as extracting ransom. Acts that are politically motivated i.e. done with the objective of intimidating a population or of compelling a government or an international organization to do, or to abstain from doing any act, do not qualify to be acts of piracy. Terrorism at sea is a recent phenomenon as compared to piracy. Piracy has increasingly been linked with the risk terrorist attacks at sea. Both, piracy and acts of terrorism are international or transnational crime. Although they are distinct crimes, the distinctions between the two are narrow and unclear. Due to this reason, pirate attacks are sometimes labeled as maritime terrorism. For example, the attack in January 2004 on an Indonesian fagged product tanker MV Cherry 201 was conducted by members of the Free Aceh Movement (FAM). This group is an internationally recognized terrorist group, but the event was recorded as pirate attack. Piracy and terrorism generally has a tendency to overlap as both have a lot in common. For example, in both the cases, the attack against ships is caused by high speed boats carrying personnel armed with sophisticated weapons. The methods used to seize a ship are also in general similar. Both crimes involve bands of brigands that divorce themselves from their nation-states and form extraterritorial enclaves; both aim at civilians; both involve acts of homicide and destruction. In addition, the two may also overlap in the sense that pirates may provide training to the maritime wing of international terrorist groups or the terrorist groups may use pirate groups for arms smuggling. Nonetheless, piracy and terrorism are not interchangeable phenomena. Piracy is primarily motivated by private gains, while terrorism is motivated by political objectives. The SUA convention for the Suppression of Unlawful Acts Against the Safety of Maritime Navigation complements the UNCLOS provision regarding piracy. Article 3 of the SUA Convention defines the relevant convention offences. Where it does not explicitly refer to acts of piracy as such or to the definition of piracy contained in article 101 of UNCLOS, many of the acted listed in Article 3 contain the basic elements which typically fall within the crime of piracy. The SUA treaty constitutes an international response against terrorism abroad ships and fixed platforms and armed robbery at sea. It contributes to the implementation of Article 101 of UNCLOS, and the thwarting of armed robbery. However, the primary function of the SUA Convention is not the suppression of maritime terrorism, but the apprehension, conviction and punishment of those who commits such acts. Crimes against ships differ in implementation, objectives and type of perpetrators. 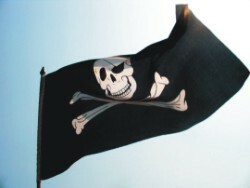 Different definitions of piracy exist as an effort of several institutions. However, the lack of standard and comprehensive definition of piracy results in some subjectivity in the available statistics. Given the diverging definitions of piracy in international legal systems, it is argued that greater uniformity in the law is required in order to strengthen anti-piracy legal instruments. It is also argued that a consistent definition would help prosecutors punish criminals as the actions of a pirate must agree with the definition of piracy to lead to a criminal conviction. The international sea piracy law seems to be handicapped by the fact that its geographical scope of application excludes territorial waters, a maritime zone where the majority of piratical acts, better known as armed robbery against ships in the IMO definition, take place nowadays. If these acts are to be seriously confronted and suppressed then it is imperative that the international legal regime on piracy applies also territorial waters. Moreover, the definitional requirements in UNCLOS preclude the applicability of piracy laws to acts of maritime terrorism. Furthermore, the UNCLOS definition of piracy includes a 'two-ship requirement' i.e. the illegal act must be committed by one ship against another ship. This requirement precludes numerous maritime terrorist acts from being classified as piracy. Therefore, it is also equally necessary that the world adopt a new legal definition of piracy that acknowledges the piracy-terrorism link. The writer is Assistant Professor, Department of Law, Premier University, Chittagong.